Food – a supermarket that sells Dark – yes, dark! – Chocolate Hobnobs again. The Smugglers’ Cott must be the best carvery we have ever visited. A choice of four meats. Not just beef, pork and turkey, but lamb, too. And the beef was offered in rare or well done joints. The kids asking for ‘a piece of crackling for my mum, please’. Being introduced to the Baobab fruit at the Eden Project, especially when its powder is added to a Pineapple and Coconut Smoothie. The most refreshing drink of the summer, and apparently an energy booster. Will it help us keep up with Mark? Kelly’s award-winning fish and chips. Beware the Trip Advisor reviews, many of which are based on the over-priced eat-in restaurant: the takeaway is excellent. Moomaid ice cream: when a dairy farm made losses on milk sales, it decided to use it’s milk production differently. They tried cheese, and then struck gold with ice cream. Cornish ice cream is great anyway, but this beat anything else we tasted. No additives, so the choc mint crisp flavour is white, not green. Shame the Eden Project stopped selling it, because Moomaid wouldn’t drop their prices to uneconomic levels (they must have learned their milk-selling lesson, but how ethical and Fairtrade was the EP on this issue?). Worship – Steve Wild trying everything to involve our children in worship at Riverside Church. Bringing Horace the Frog with him. Asking them to pick a favourite hymn (a lost cause when the church only used 1982’s Hymns and Psalms and still the 1936 Methodist Hymn Book). Purloining Jaffa Cakes for them from the refreshments area before the service ended. Mark hearing ‘Battle Hymn of the Republic‘ as an actual hymn for the first time, but nevertheless singing, ‘Glory, glory, Tottenham Hotspur‘. Place – I’ll mention it again: the Eden Project. Stunning is an inadequate adjective. We want to return. Twice. Looe itself: even with all the tourist shops, it retains an old charm. Fishing trawlers share harbour space with pleasure boats. 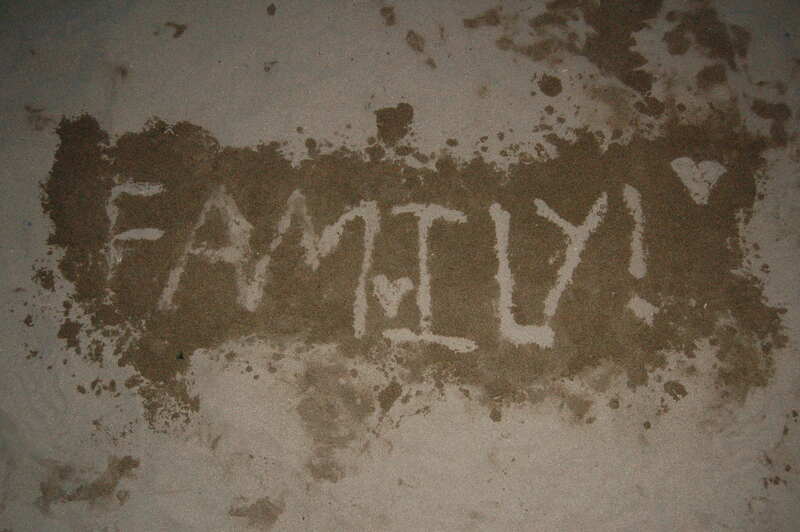 Family – aside from the four of us and Rebekah’s sand sculpture of the word ‘family’, the good was to see cousins. My cousin, his wife and son. Debbie’s cousin , his wife and children. The bad – my mum falling and fracturing her hip on our second day here, the burden falling on my sister and her family, and us powerless at two hundred miles’ distance.